One of the many benefits of college life is that the breaks tend to be significantly longer than those I’ve grown accustomed to in grade school. I get three weeks off for Christmas, and a lovely, ten-day break for Thanksgiving. One of my roommates was so kind as to invite me to her house for Thanksgiving break, and since Fort Meyers only 2 hours east of Sebring, significantly closer than Alaska, I consented. I pondered this question for a moment, and God gave me an incredible insight: They look for Jesus. They want to marry someone who loves them unconditionally. Someone who gives them a reason to get up in the morning. Someone who fascinates every aspect of their mind. Someone whom they would spend a lifetime trying to understand, knowing they never fully will. Someone the likes of which they’ve never encountered, someone altogether different. Someone whom the can admire, respect, and trust. Someone who is strong enough to lead, yet humble and considerate enough to listen. Someone who really cares about them and will do anything for their good. Someone who’d be willing to die for them. They want to marry Jesus. Just look at our books, movies and fairy tales and you can see that: we want “true love”. And of course we do, God hard-wired us that way. He put that desire within us. The only trouble is, we can’t marry Jesus. There is no man, no woman on this planet who can fit that mold. Sure, a relationship can have certain aspects of that dream, but no one can fulfill all those needs. And I think that’s one of the main reasons why so many marriages in America fail: People are trying to marry Jesus. They put a burden of unreasonable expectations upon their spouse, and it’s only a matter of time until either party crumbles under the weight, and both people give up, dissapointed and broken-hearted. So why did God put this deep want within us, if it can never be met? Is He really that cruel? Yes, and no. God has purposefully made it so we cannot find the answer to our deepest desires in another person. It’s impossible. And I think He’s made it this way so that as we experience dissapointment after heart-breaking dissapointment when we try, we realize that He alone can meet that need, since He made it. He alone is Jesus. He put this desire within us so that we will want a relationship with Him. Only if we allow ourselves to the Bride of Christ will we find the deep fulfillment we so desperately long for. Then, and only then, will our other relationships flourish. When our soul-hunger is being fed in a continuous relationship with Jesus, we do not have a burden of unrealistic expectations to place upon someone else. Jesus bears that burden with ease, allowing us to trade our weighty aching for His “rest” (Matt 11:28-30). 1) What a profound way of sharing the Gospel. So many of my peers are reeling from the after-effects of divorce, searching for meaning behind it all. And Christ offers that meaning. I have personally experienced such (check out my previous post: Hesed). So I’ve been praying regularly (the idea was everyday, but my life’s kinda crazy, so whenever I think of it), for God to show me what forgiveness really means, what it looks like practically for me. And, after talking with Kirsten, my mentor/discipler here, I recognized that the learning process might have already begun, so gently that I haven’t even realized it. Awesome. The Lord replied…. “I will show you which of his sons to anoint for me.” So Samuel did as the Lord instructed.” 1 Samuel 16:1-4. As we read this passage, my mind flashed to my forgiveness journey. Samuel had completely given up on Saul. God had left Saul to his decision, and had already set someone else aside to fill his place (think: David). But when do we reach that point in our lives, where we can just give up on someone? The only reason Samuel could give up on his relationship with Saul that God directly told him to. And that’s the kicker. God is in charge, and He only takes so many slaps in the face before He just leaves you to your own way (Romans 1:18-32). But, and it’s a crucial “but”, unless God gives us the direct revelation that this person has reached that Romans 1, Saul point, as far as our relationship with them is concerned, they have limitless chances to try again. We have no right to give up on them, to dismiss them. We don’t always have to maintain the same kind of relationship, but you don’t have the right to just give up on the relationship altogether. We are to extend the same grace that was extended to us, “bearing with one another, and forgiving each other.. just as the Lord forgave you, so also should you.” Colossians 3:13. And then today, we made it to David’s most infamous blunder, adultery with Bathsheba and his attempt at covering up, in 2 Samuel. I really wrestled with 11:27; after all David’s mistakes, he just marries the girl, so that makes it all better? Moving on? David’s doing the right thing now, so all his past sins are just over now…. What about repentance? That got me thinking… How am I to respond to someone who, after patterns of sinful, unrepentant behavior, just suddenly chooses to do the right thing? No repentance, just right choices. How do I, as a believer, respond? Do I stop them in their tracks and demand repentance out of them? Or do I just roll with it, forgetting the past and emphasizing their current choices? Well, I really don’t think the first option would work, nor am I capable or called to make anyone repent. As I chewed on this concept, slowly the right picture came into view. I should acknowledge that their past actions were wrong, but once that’s been acknowledged, I just need to move on and encourage them in their right choices. It’s not fair for me to both demand Godly behavior and keep bringing up past wrongs; no one can stand up under such pressure. I need to realize that their sin is between them and God, that He will either let them keep living in their sin (they’ve reached that Saul point) or He’ll bring them to a point of repentance (like He did David, in 2 Sam 12:13). Even after repenting, they’ll likely still have to deal with the consequences of their sin (David sure did), but they’ll be in right standing with the Lord, who will give them the strength to glorify Him through the difficulty. So really, forgiveness is relinquishing my “right” (need, really) to demand change from the other person. It’s seeing the person as one loved of God, with limitless chances to repent (unless God says otherwise), and encouraging any Godly change you see within them. Not to be trite or uber-spiritual, but this has been one of those weeks where I’ve realized that when you give God the rights to run your life, that means that He can put things in your path. Unexpected things. Hard things. What-am-I-supposed-to-do-with-this? things. But this is what God has given me, the cross I’m daily to bear for the next few weeks. Deep breath…. So be it. The one blessing I’ve already seen from these new developments is a renewed drive to pray, and pray hard. God is showing me both my need to talk with Him and what to pray for: that I will recognize His voice. Through all the noise of my own mind, dreams, plans and ideas (combined with the counsel of people I love), I pray that the voice of my Father will be loudest and clearest. That this sheep would recognize the voice of the Good Shepherd and follow. God will not empower me, lead me, make me more like Christ so I have the strength to do more things. He empowers, leads, sanctifies so we can see things from His perspective: He alone is the One who moves. I am just a vessel. As I face these next few weeks (which I realize only seem SO big because I’m right in the middle of the storm), as I continually try to plant myself at the feet of my beloved Savior, I want to remember this truth the Spirit gave me: Maturity is seeing things God’s way. When we read the story of Joshua and the Israelites conquering the land of Canaan, we are likely to focus on one of the two aspects of God’s nature that are expressed there: His grace or His justice. Since we do not see things from God’s perspective, we can read Joshua 10 and only see God’s grace. He is fulfilling His promise to Abraham, Isaac, and Jacob by giving them a land, allowing them to have victory wherever they go; “I gave you a land on which you had not labored, and cities which you had not built, and you have lived in them; you are eating of vineyards and olive groves which you did not plant” Josh 24:13. Wherever Israel went, blessing followed. Or we can see only His holy justice; He is killing thousands of people, child-sacrificing, idolatrous Canaanites, (look at Josh 10:29-40, or 12:7-24.) Wherever Israel went, utter destruction followed. How can we reconcile these two, seemingly-contradictory truths? 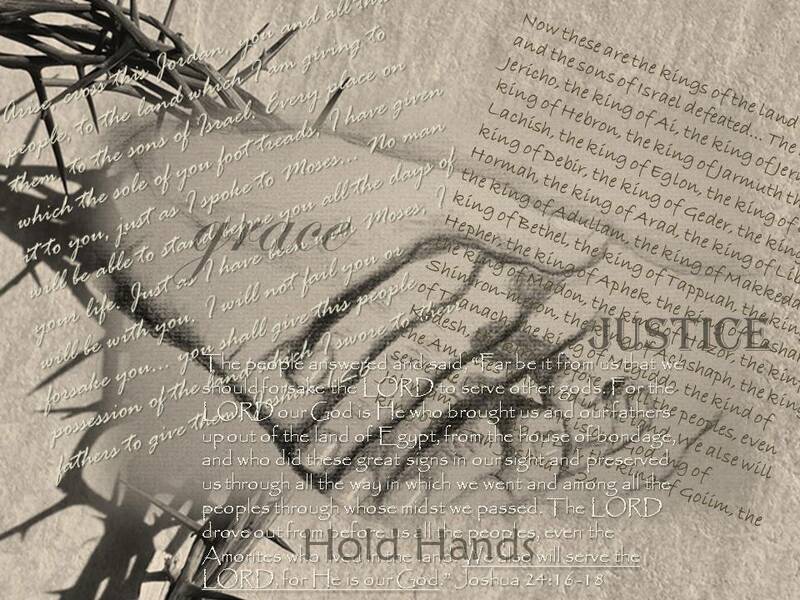 Rather than seeing God’s grace and justice as two different, or opposite, attributes, maybe we should see them as two hands, intertwined. As if they were holding hands, both grace and justice are seen in each move of God throughout Joshua 6-12, the fingers of blessing and judgment in each action of the Israelites. To support the “grace hand” in the picture, I’ve chosen Joshua 1:2-6, where God promises victory to Israel wherever they go, so long as they obey Him. And since they did obey (Josh 24:31), we see God providing for His people in mighty, miraculous ways. Over the “justice hand” I’ve put Joshua 12:7-24, an exhaustive list of every king that God gave over to Joshua for utter destruction. Central to the picture, I’ve put the closing passage of the book of Joshua, 24:16-18. As Israel conquered and settled into Canaan, they saw God move in grace and justice, which motivated them to live in humble worship. The climax of the story is underlined, verse 18: “The LORD drove out from before us all the peoples, even the Amorites who lived in the land. We also will serve the LORD, for He is our God.” Though from a broken, human perspective, Israel saw that God was both gracious and just, and dedicated themselves to living in worship of Him. Jesus, His grace is poured out upon us. So put the crown of thorns in the background: these two attributes of God woven together into one painful, beautiful expression.